The 29th Annual Midwest Golf Celebrity Pro-Am to benefit Far West Suburban/Area 2 will be June 20 at The Royal Fox Country Club in St. Charles. 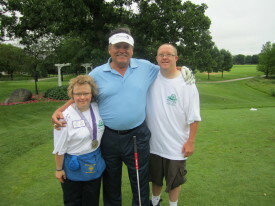 Molly Sosnowski, Eric Soderholm and Kevin Mikan at the 2015 Midwest Golf Celebrity Pro-Am. The format for this year’s event will match professional athletes, and other celebrities with amateur foursomes in a scramble format tournament. Some of the celebrities expected to attend are Eric Soderholm, Cliff Levingston, Ronnie Bull, Ike Hill, Bob Parsons, Paul Popovich and Jim Thornton. Registration begins at 9 a.m., with a shotgun start at 10:30 a.m. There will be cocktails and a dinner/auction after the day’s golfing. This event offers attendees the opportunity to join the network of corporations and individuals who contribute to the success of thousands of Special Olympics athletes in the Chicagoland area. Please join us this year as a sponsor or individual golfer, or if you can’t attend, consider making a financial contribution. For more information, contact Amy Kaylor at 630-377-7250. View event registration flyer. More than 175 people showed up on Saturday, April 23, for the 11th Annual Young Professionals Board Pub Crawl. Pub Crawl guests visited seven pubs in the Wicker Park neighborhood of Chicago and enjoyed drink and food specials throughout the day. Warm weather contributed to a fun afternoon enjoyed in a historic part of Chicago. The event concluded with food donated by Chipotle and a fun raffle. Event co-chairs Kaitlyn Rosen and Mae Rodovitch and their planning committee arranged a fabulous raffle featuring tickets to comedy clubs, bowling parties, gift cards to spas and salons as well as gift cards to more than a dozen Chicago restaurants. 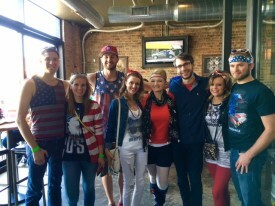 Several guests were awarded best costume as part of the Team America theme and received restaurant gift cards in recognition. The event raised more than $4,600 to support athletes who participate in the Chicago/Area 3 program. Cook/Area 18 Spring Games were no exception. Amongst these volunteers were Austin Schwantz, a junior at Fremd High School, who recruited his fellow football teammates to help with set-up and tear down of Area 18 Spring Games at Prospect High School in Mt. Prospect. Austin is no stranger to volunteering. He helps coach the Blue Jays Special Olympics basketball team with some of his teammates who have siblings with special needs. This winter he looked to expand his efforts. He wanted to further give back in a way that could also bond his team so he registered for the 2016 Palatine Polar Plunge. While they were reluctant at first, the football coaches helped to empower the team stating that if the team plunged, they would plunge, too. The Fremd Football went on to raise $3,000. 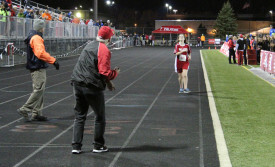 On April 23, Palatine High School hosted Distance Night in Palatine – an event deigned to bring the best high school runners together from throughout Illinois and the Midwest while raising money for charity. Distance Night in Palatine is a unique fusion of elite distance racing, music and fun. 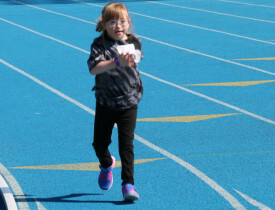 Races included the 800-, 1,600- and 3,200-meter distances as well as an 800-meter race for Special Olympics Illinois athletes. “This race allows us to celebrate the true meaning of competition – to run to the best of your ability,” said Chris Quick, Palatine High School English teacher. Quick was inspired by his brother, Chad, who competed in wheelchair races and more through Special Olympics during his childhood. The Special Olympics 800 took place right before the “Main Event” races later in the evening and the participating athletes received a warm introduction prior to running. 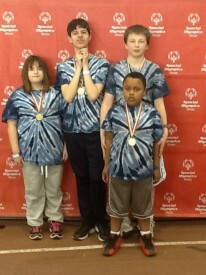 This year’s event raised $1,870 for the athletes of Special Olympics Illinois. Thank you to Palatine High School and all of those who participated in Distance Night for their support! Watch video of event.